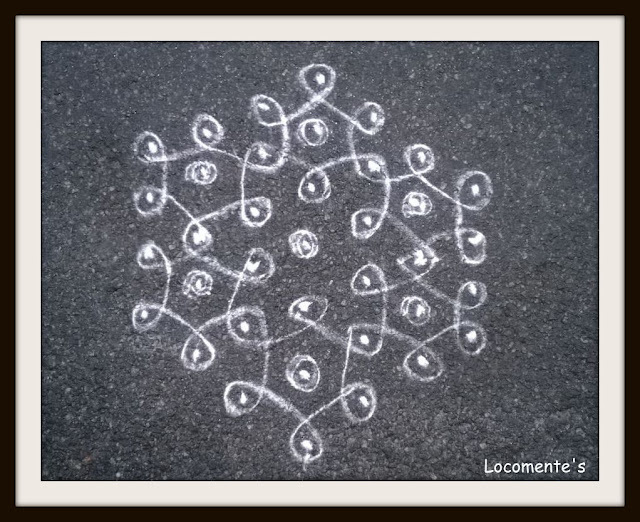 Kolam refers to intricate patterns drawn both free handedly and by joining dots. These can be widely seen in the Southern part of India. Women draw this early morning, preferably before Sunrise after cleaning the courtyard. Earlier rice powder was used – it was a means to feed ants and small insects. However, these days, stone powder and even chalk is used. If such powders are used, it is called Pudi Kolam. Sometimes, brick powder will be used as outline on auspicious days, Tuesdays and Fridays. If rice powder is mixed in water and similar patterns are drawn, it is called Maavu/Maa Kolam. In West Bengal, it is called Alpona. In North India, people used rice/stone powders for the outline and fill the patterns with colors. This is called Rangoli. It is believed that Kolam brings prosperity. It is drawn for almost all the auspicious occasions like marriages and festivals. When someone dies in the household, the family don’t draw any kolam for a year. Children in small towns learn the art of making kolam at a very young age. In fact, a girl who knows to draw impeccable and intricate kolam is a pride for the entire family and the village she stays. However, owing to modernization, city life and apartment culture, this art is soon dying. Lovely, lovely kolam, L !!! ... I have been doodling and practising on paper ... so fun. Love, cat. BTW: U r not drawing this in one stroke, r u? ... cuz I could never master that ... c.
Looks deceptively simple. But it is hell to actually try this particular design, I couldn't even do a decent version on paper. Kolam is always lovely in look and holy in spirit. Nice kolam! Looks easy to draw!